No, that’s just the sound of Queen Elizabeth’s delightful corgi crew’s collars jingling through Buckingham Palace. The British royal family celebrates the holidays just like any other family: huge black-tie dinners with huge feasts served on solid gold chargers. What, you don’t wear your granny’s 10-carat diamond necklace to set out cookies for Santa? OK, so maybe the royals are not quite like us. They do have some lovely holiday traditions of their own, though, and for them — like us — it’s all about family. 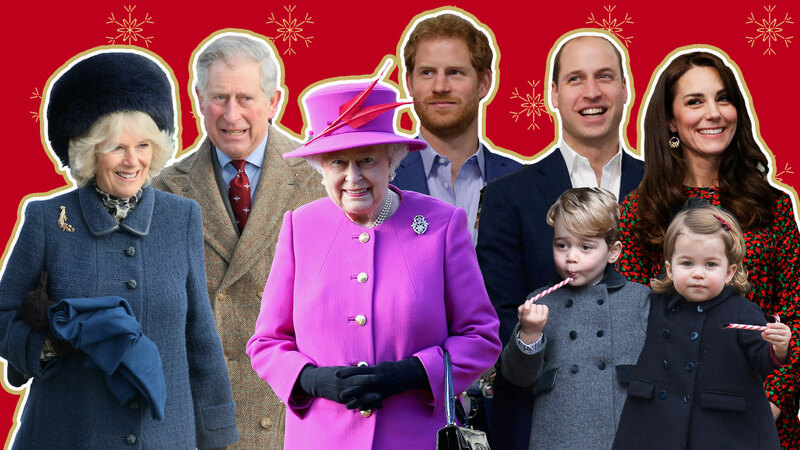 The royal family is huge, what with all the cousins and nieces and nephews, kids and grandkids and great-grandkids, so seeing them all on Christmas Day would be quite impossible for the queen and Prince Phillip. Instead, she hosts a big pre-Christmas lunch at Buckingham Palace a few days before she leaves for Sandringham, her private retreat. The lunch gives the whole fam a chance to catch up. Shortly after the pre-Christmas lunch — usually around Dec. 21 — the queen and Prince Philip depart for Sandringham, where they stay until well after the New Year. But they don’t spend the holidays alone! Just a couple of days later, the closer relatives start showing up: mainly the royal couple’s children, grandchildren and great-grandchildren. They begin their arrivals on Dec. 23 in order of precedence, with Prince Charles and Camilla, Duchess of Cornwall, the last to arrive. Most stay at Sandringham House, while Prince William and Catherine, Duchess of Cambridge, stay just down the road at their country pile, Anmer Hall, with Prince George and Princess Charlotte. Catherine’s family often joins them at Anmer Hall. By Christmas Eve, everyone has arrived, and the party can begin! The clan all gathers to put the finishing touches on the queen’s Christmas tree. Gifts are laid out on a large table in the Red Drawing Room and are opened at tea time. But don’t expect diamonds and pearls wrapped up in ribbon. The royals much prefer jokey gifts or homemade items. Later that evening, around 8 p.m., the kids are sent off to bed with their nannies and the grown-ups sit down to a formal black-tie dinner. On Christmas morning, the family enjoys a full English breakfast, then heads off to church, walking to the Church of St. Mary Magdalene together (the queen gets a ride), and providing us with a wonderful photo op. Then it’s back to Sandringham House for turkey with all the trimmings. At 3 p.m., they all gather to watch the queen’s Christmas speech on TV — except for the queen herself, who prefers to bow out and have a little alone time. Then the servants get to relax while the royals insist on serving them. The fun continues on Boxing Day, when Prince Philip hosts an annual shoot. After that, they all begin to drift off to enjoy their winter breaks. For example, Camilla leaves to see her own grown children before joining Prince Charles at Birkhall, their home in Scotland. The queen and Prince Philip stay on for several more weeks, enjoying a winter break from the hustle and bustle of London life. Sounds like a pretty jolly holiday to us!